Less than 2% of Brazil’s indigenous tribes have undertaken projects that reduce greenhouse gas emissions from deforestation and forest degradation (REDD), but more than 40 indigenous leaders are now getting ready to change that. In the process, they’re turning “free prior and informed consent” into more than just a vague concept – and perhaps providing a model for the rest of the world. COORDINATION: fostering of better land use governance, coordination and alignment with national, regional and local policies and guidelines, management tools and processes. 7 July 2010 | Hardly a day goes by that we don’t hear about mechanisms designed to slow climate change by paying people to capture carbon in trees and reduce greenhouse gasses from deforestation and forest degradation (REDD) combined with conservation and forest management actions (REDD+). Then, before the day is done, we hear ominous warnings that REDD could spark a land grab that destroys the livelihoods of indigenous people like Brazil’s Suruí­, whose forests suddenly have value as carbon sinks. Suruí­ Chief Almir Narayamoga Suruí­ says the warnings aren’t unfounded – but, while many indigenous rights organizations are fighting to keep REDD at bay until new international agreements offer more clarity on the rights of indigenous peoples, Almir is urging other indigenous leaders to bone up on laws and mechanisms that already exist and to use that knowledge to their advantage. “The communities need to understand what these markets are really about and the compensation logic,” he says. “That is, they must learn that their relation with the use of land results in preserved forests and that there is a voluntary market that recognizes this acting role”. In fact, he’s using REDD to jump-start his fifty-year plan for synching the tribe with the high-tech global economy while preserving age-old traditions. That jump-start comes in the form of REDD-funded schools and health care, which will build the foundation for a sustainable tribal economy once the REDD money is used up. He’s already persuaded his fellow Suruí­ to forego income from logging and hold out for carbon money, and earlier he worked with environmental non-governmental organization (NGO) Forest Trends (publisher of Ecosystem Marketplace) and the Baker & MacKenzie law firm to clarify his tribe’s legal claim to the land. That legal clarity should, he says, make it easier for other tribes to also earn income by preserving their forests and their traditions. Those tribes, however, aren’t biting. Environmental NGO Idesam (The Institute for Conservation and Sustainable Development of Amazonas) says only three other Brazilian tribes have undertaken REDD projects so far, and none are nearly as far along as the Suruí­. That’s four out of roughly 230 tribes identified by the Social Environmental Institute (ISA) NGO, or less than 2% of the nearly 13% of Brazilian territory controlled by indigenous people. Almir says it’s not because they don’t want to. Rather, he says, too many tribes simply don’t understand REDD or its potential – not to mention business basics. That knowledge, he adds, must permeate the tribe, and the tribe must maintain ownership of the project. He achieved these goals by first forming an entity called the Associaçí£o Metareilí¡ do Povo Paiter-Suruí­ (Metareila Association), which acts as a conduit between the Suruí­ and the larger world. 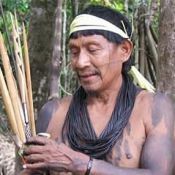 Within the tribe, the Metareilí¡ Association worked within the social and political organization structure of the Suruí­ people to discuss project development issues and priorities with the local communities, working with all four clans that represent the Paiter-Suruí­, namely Gameb, Gamir, Kaban and Makor. As a result, the Suruí­ embraced the carbon project, believing that it can provide continuation for their reforestation efforts and because of its consistency with the priorities established by their leadership, representing a real potential to support the implementation of their Fifty-Year Development Plan. Therefore, the initiative to start the project was their autonomous decision, culminated in the signing of a cooperation agreement document in June of 2009 by all 4 clans, through their respective associations. The agreement establishes that the clans will be working together to implement the carbon project, in alignment with their Fifty-Year Plan, and that all economic benefits will be shared in a just and equitable way among the Suruí­ communities. There were several internal meetings of the Suruí­ leadership without the participation of project partners, technical meetings with project partners, as well as community assemblies. In addition, an extensive process of 10 village-level information sessions covering 14 villages, led by ACT-Brasil and local Suruí­ promoters also provided the opportunity in detail to discuss the nature of REDD and climate change mitigation finance, and the types of commitments they would be likely to entail. This process has been documented through an extensive archive of video footage as well as a detailed summary report prepared by ACT-Brasil. The signing of the cooperation agreement between the clans was a milestone in an extensive and carefully constructed, highly participative consultation process, that embodied the principle of free prior informed consent, an important standard for respecting indigenous rights established in the United Nations Declaration on the Rights of Indigenous Peoples acknowledged in the ILO 169 Convention, as well as a recommended best practice by the international indigenous rights’ community. Now Almir is sharing his REDD experience with representatives from traditional communities, NGOs, social movements, and other indigenous tribes in workshops that Forest Trends is hosting in various Brazilian locations. His goal is not only to help people understand what he’s learned, but to harvest that understanding for the creation of a Document of Social and Environmental Principles and Criteria of REDD, which will establish minimum social and environmental standards for REDD projects in Brazil. Beto Borges, who runs the Communities and Markets Program at Forest Trends, says the next step is to develop ways of certifying that these communities really do understand the process, and that they are conscious of their own responsibilities with regard to the preservation of natural resources. The idea for the guide was hatched at the 14th Katoomba Meeting – an event held by the Katoomba Group in the State of Mato Grosso in April, 2009. At this meeting, traditional and indigenous communities showed concern about perceived risks associated with REDD projects and other programs they feared might disregard their traditional rights and generate social conflicts. When REDD is mentioned in Amazonian communities, the main concern is that the community will neither get access to funding resources nor be able to make decisions about projects to be implemented. Their main desire is to guarantee that their voices are heard in the process of formulating public policies and of new market mechanisms regarding REDD. In this context, the Katoomba Meeting spawned a Multisector Committee responsible for the elaboration of these principles and criteria for REDD in the country where it was created. In addition to social movements and family farmers, the group was composed of representatives of the different sectors involved with the subject, like the rural and forest producers, research institutions, and environmental NGOs. After eight months of work, the Multisector Committee established the foundation of the document and began the second construction phase: public consultations to the communities and private sectors. “To be a comprehensive national document, recognizable by the Brazilian society, this elaboration process must embrace the different sectors involved or affected by the REDD issue and be transparent and open to public participation,” the document reads. Three meetings were held in March and April with 40 indigenous leaders, extractive communities, such as rubber tappers and family farmers, in addition to technicians from local non-governmental organizations. Each meeting lasted three days. During the first day and half of the second, time was spent leveling the knowledge of the participants in climate change and greenhouse gas emissions. The remainder of the second and third day was dedicated to the study of the document. According to Mauricio Voivodic, researcher from Imaflora NGO – the assisting organization in the elaboration process of Principles and Criteria – it was a real challenge to level the various representatives’ knowledge in only a day and a half. Aiming at effectiveness, REDD concepts were not presented only in its theoretic form, but rather from the already existing experiences. During the whole process, representatives from the federal government or from local governments participate only as observers. Their opinions will not be considered at this moment because the organizations involved wanted the document to be exclusively an expression of opinions and yearnings from civil society. In addition to the meetings with the traditional and Indian communities, another was held at the end of April with the organizations established at the north of Mato Grosso state, location of the ‘arc of deforestation’, from where the agricultural frontier and deforestation head forward, and also where there are already advanced discussions about REDD. In April, meetings took place in Sí£o Paulo with representatives from the private sector in hopes of enhancing new contributions. In all, five presence meetings were held and 560 comments from Indians, traditional communities and the private sector were added to the document. All comments are now being considered by the Multisector Committee, which is responsible for the final version of the document. According to Voivodic, the comments propose only adjustments in the text, meaning that there will be no concept changes. Launching of the final version of Principles and Criteria is scheduled for the second half of August. According to Paulo Moutinho, from the Amazon Environmental Research Institute (Instituto de Pesquisa Ambiental da Amazí´nia, IPAM), an NGO also participating in the process, this construction model of Principles and Criteria, based on effective civil society participation, will surely be able to be adopted by other countries. He says the basic requirement for such a process to work out is by leveling knowledge of all the participants involved and total exemption on the subject. “It is necessary to have clearness about what is being discussed and if there are guarantees that the process is exempt from ideologies and personal or political interests on behalf of those who help or lead the process”, Moutinho explains. Cristiane Azevedo is a Brazilian reporter based in Sí£o Paulo. She can be reached at crisprizi@gmail.com. What Will it Take to Make Sure REDD+ is Safe?